Backyard vegetable breeding It isn't that difficult. Carol Deppe was a guest here a few months ago, talking about how most people misunderstand the potato, which is about as nutritious a vegetable as you could hope for. I found out about that because I was checking out her new book, The Resilient Gardener, which offers all kinds of advice for making the most of home-grown food. In that, Carol talks about having bred a delicata squash with a taste like a medjool date. That sounded intriguing, but in a way not all that surprising. 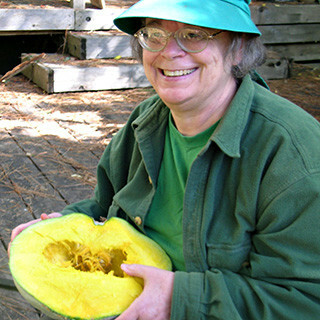 If anyone could breed a squash – or pumpkin – that tasted like a date, it would be Carol Deppe. Her earlier book, Breed Your Own Vegetable Varieties, is a wonderful, informative and accessible book about the science of plant genetics. It is, in fact, better than all the text books I’ve ever read on the subject. Which is not surprising, as that’s what Deppe set out to write. The whole business of squashes seems fraught with difficulty. First off, what do you call them: zucchini, pumpkins, courgettes, summer squash, winter squash? Is there any difference (in England) between a baby marrow and a courgette, or between an overgrown zucchini and a marrow?1 And calling them by their Latin names doesn’t really help, because the same species can be used in different ways, and it is the usage that tends to determine what they’re called. The idea of drying a summer squash for use through the winter is very appealing, and Carol says that costata romanesco, and old Italian heritage variety, is one of the few varieties suitable for treating in this way. Looking at pictures, it does seem to be very similar to the variety I see on the market here, so I’m determined now to see whether I can persuade my local vegetable seller to bring me an overgrown zucchini – a zuchone, or just a zucca? He’ll probably think I’m mad, when everybody else wants them as tiny as possible. The Resilient Gardener is published by Chelsea Green Publishing. A keen amateur breeder called Rebsie Fairholm was doing wonderful things breeding a purple-podded mange-tout pea, inspired and informed by Carol Deppe’s work. Alas, she seems to have stopped for now, although you can still read about her efforts on her website. Outro music, you shouldn’t be surprised to learn, is Tonight, tonight by the Smashing Pumpkins. Sometimes obvious is good. Super interesting, also because I have seen the IncrEDIBLE at Kew Gardens just 3-4 days ago…. love it. c u soon!